Memories are made in the field. 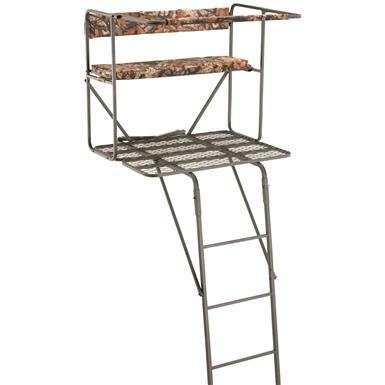 And they start by sharing the thrill of the hunt in this Deluxe 2-person Ladder Stand. 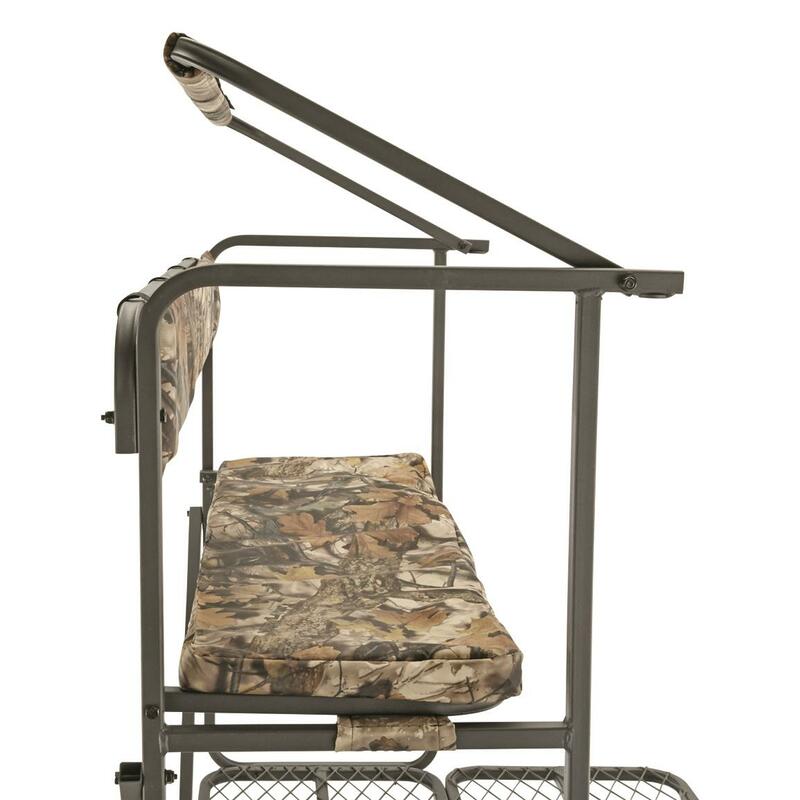 Waiting for that special moment isn't always easy—or comfortable—that's why we designed this Stand to have plenty of room and plenty of comfort for you and your hunting buddy. The strong steel build is exceptionally sturdy, which helps you stay focused on the hunt rather than worrying about your rickety stand. Plus, the extra-large foot platform gives you more leg room and eases the fear of falling off the edge. It all makes for a safer, more comfortable, more successful hunt. And the best part? 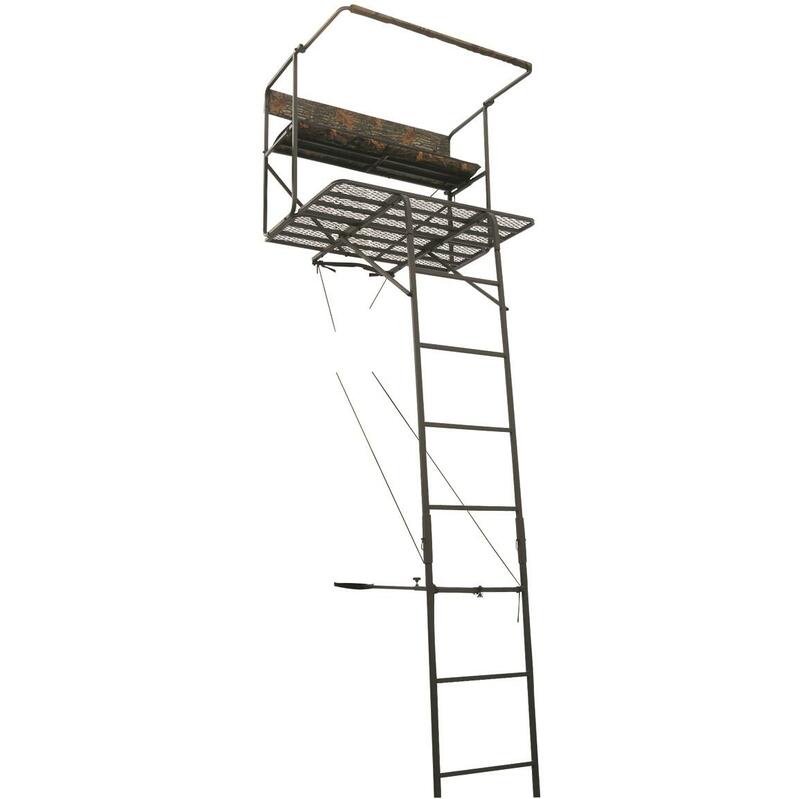 Our Deluxe 2-person Ladder Stand keeps you in the hunt longer at a price the competition can't touch. You can be close to the action and still have room between the two of you in this Deluxe Ladder Stand. 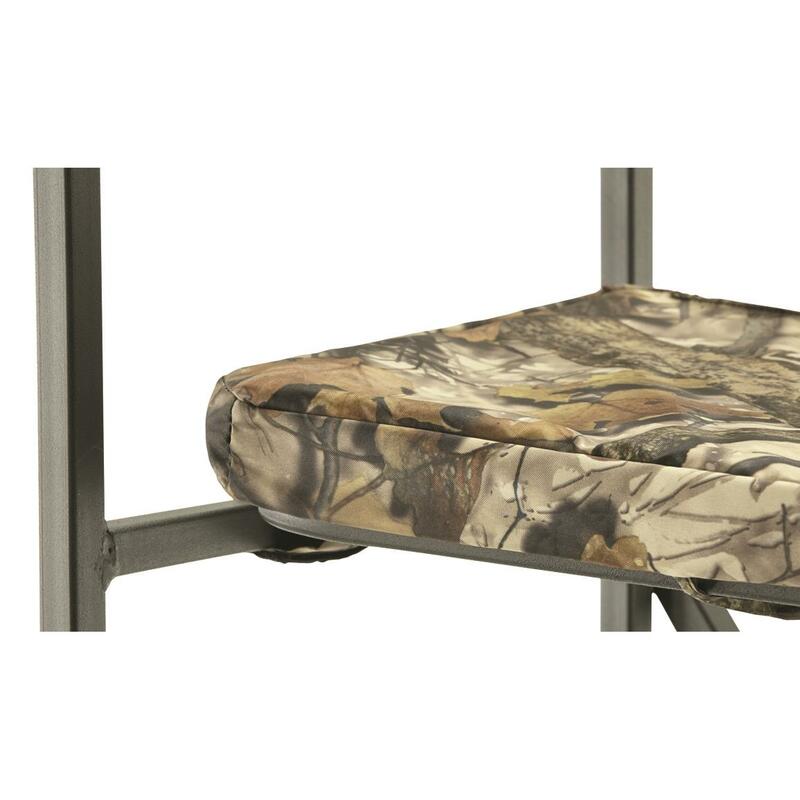 Rifle and bow hunters alike will appreciate the flip-up shooting rail and the flip-up seat that will allow hunters to either lean in for a steady shot or stand up to draw back a compound bow. 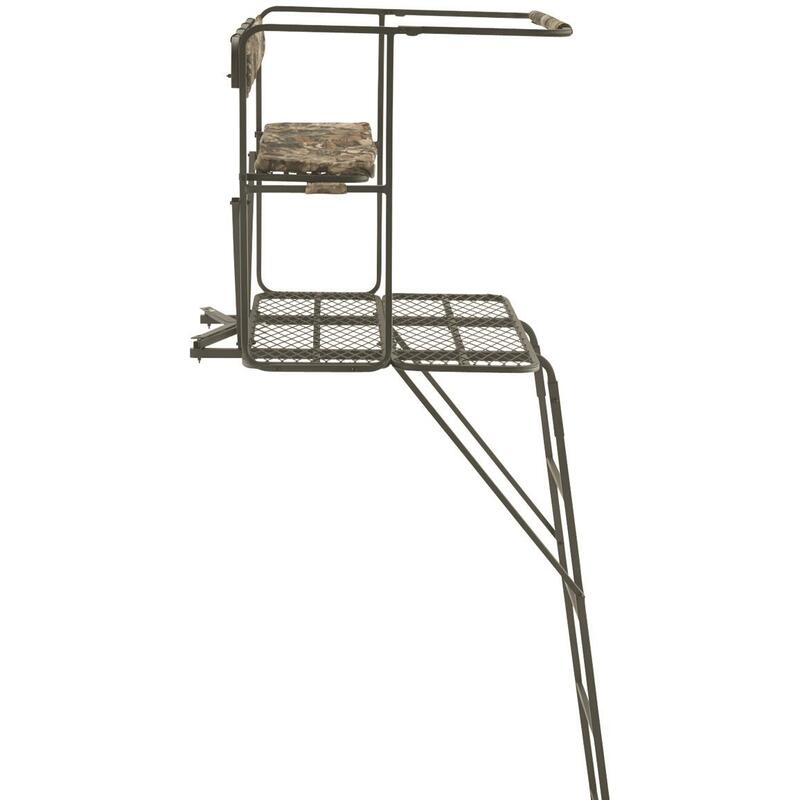 The full-access foot platform lets you stand in a stable shooting stance and since safety is paramount in the Stand, it includes 2 full-body fall arrest systems. What makes this Stand such a great value? It's loaded with hunter-friendly features, including an extra-large 40" x 30.25" foot platform that offers plenty of room to stretch out. 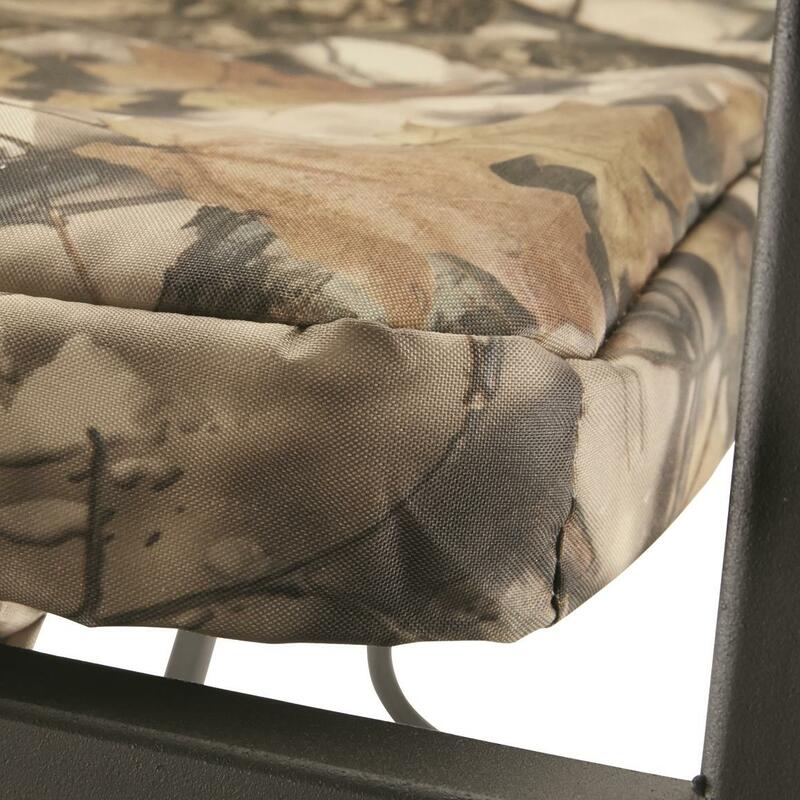 Plus, a wide padded seat that keeps you comfortable from daybreak to last light. 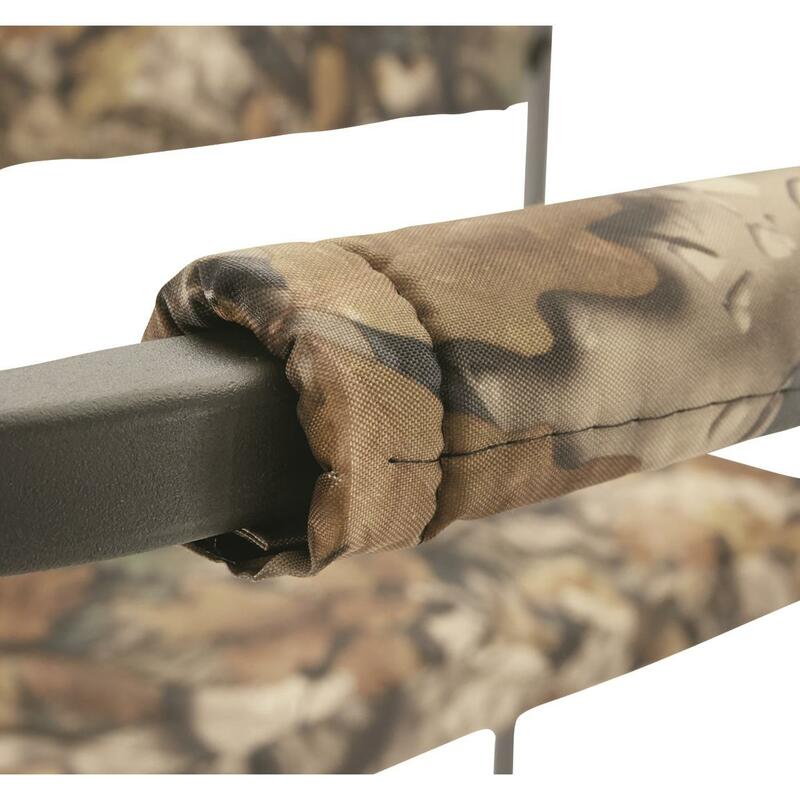 The flip-up shooting rail is padded is not only for strength and stability, but also to reduce any possible noise from your rifle or crossbow accidentally coming in contact when a big buck is on the move. 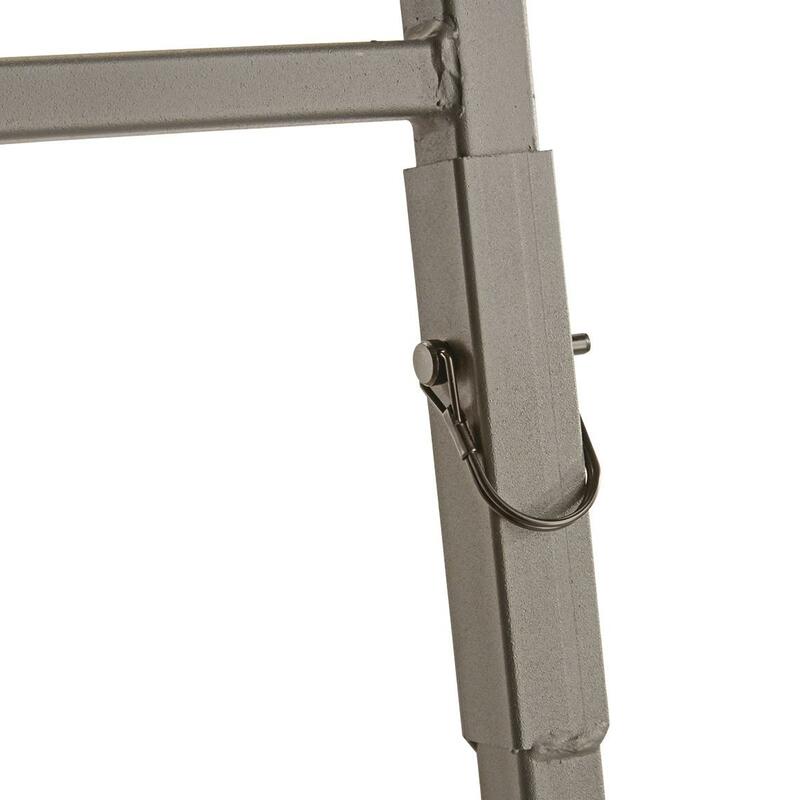 And for added stability, pinned ladder sections are oversleeved at the assembly points for a solid feel when moving up and down the stand. 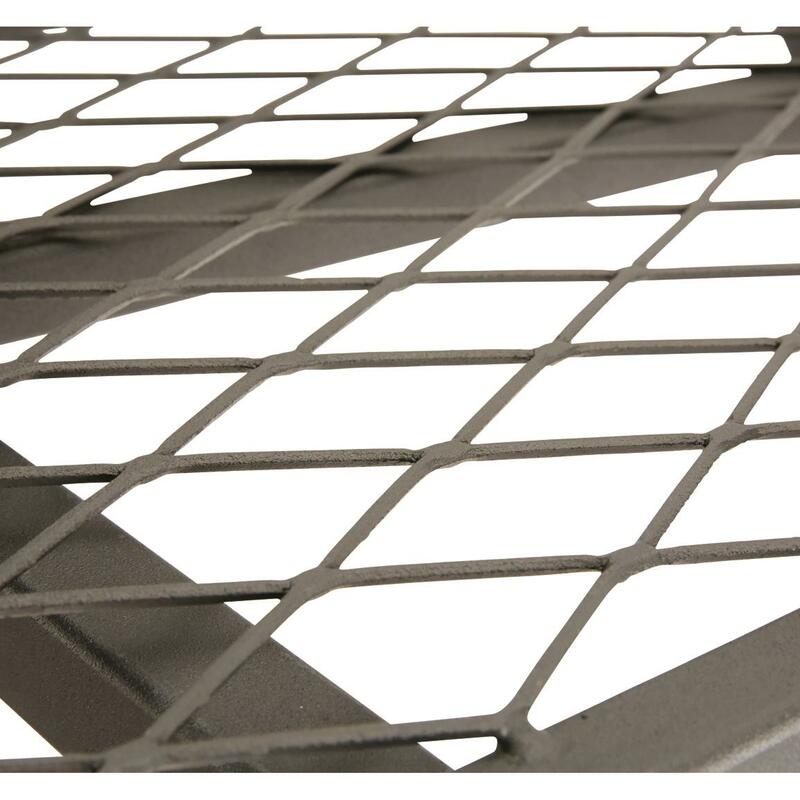 Flip-up seat is fully cushioned, measures 38.75" x 13"d.
Quiet, non-skid raised mesh platform measures 40" x 30.25"d.
Platform Dimensions: 40"l. x 30.25"d.
Seat Dimensions: 38"l. x 13"d.
Guide Gear 17.5 Deluxe 2 Person Hunting Ladder Tree Stand is rated 4.2 out of 5 by 111. 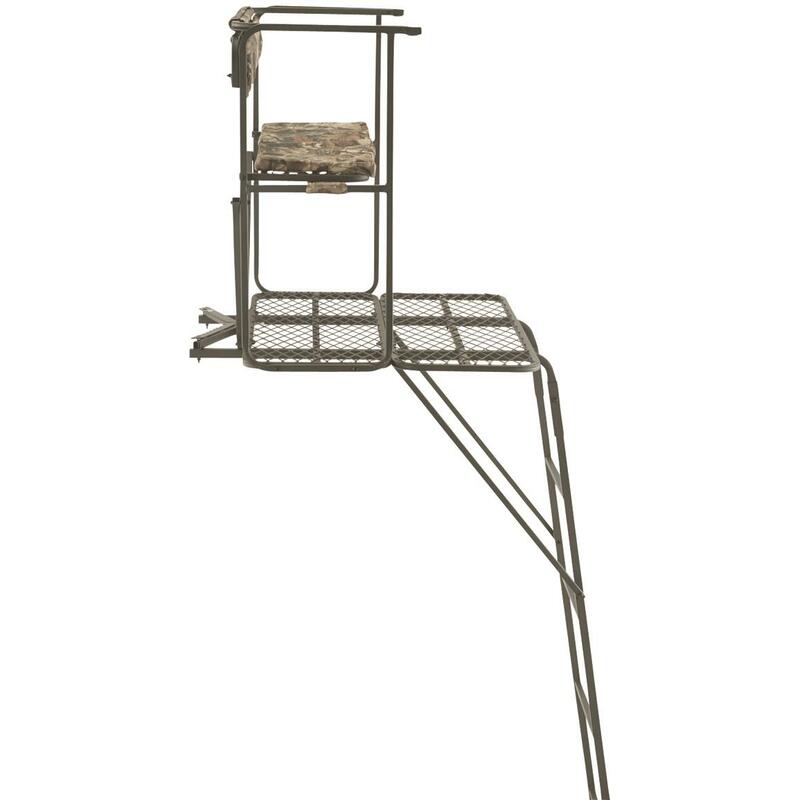 Rated 5 out of 5 by John the hunter from Excellent hunting stand This is my seventh 2 man stand ! They last long and are fairly quiet. However, the price is going up.. Rated 1 out of 5 by Tim1979 from Junk MANY missing holes, screws and bolts, instructions bad also. Rated 1 out of 5 by Chris Powell from Bad instructions and missing parts Holes weren’t drilled where the instructions stated, a piece that was supposed to be welded onto the ladder was missing, and the ratchet straps were missing the “S” hooks. The hardware lacked a couple locking bolts and actually had a wing it in it which wasn’t even listed in the components. What should have taken a couple hours took half a day. I had to drill the holes myself in order to make it work. Of all the Christmas presents for the kids I have had to put together this one was by far the worst. I will never buy anything from this company again. Rated 3 out of 5 by Tommy from Terrible Instructions The instructions were HORRIBLE!!!! One of the pieces did not have holes drilled for step freaking one. To top it all off, the dang gun rest was bent. All I can say is this freaking thing better be comfortable. I’ll try it out this weekend. If you buy it, good luck putting it together. Rated 5 out of 5 by Tree Stands from Great for the price Nice Wide 2 person stand that will work just fine out in the woods ---- Just needs better packing for shipment purposes to avoid paint chipping off . 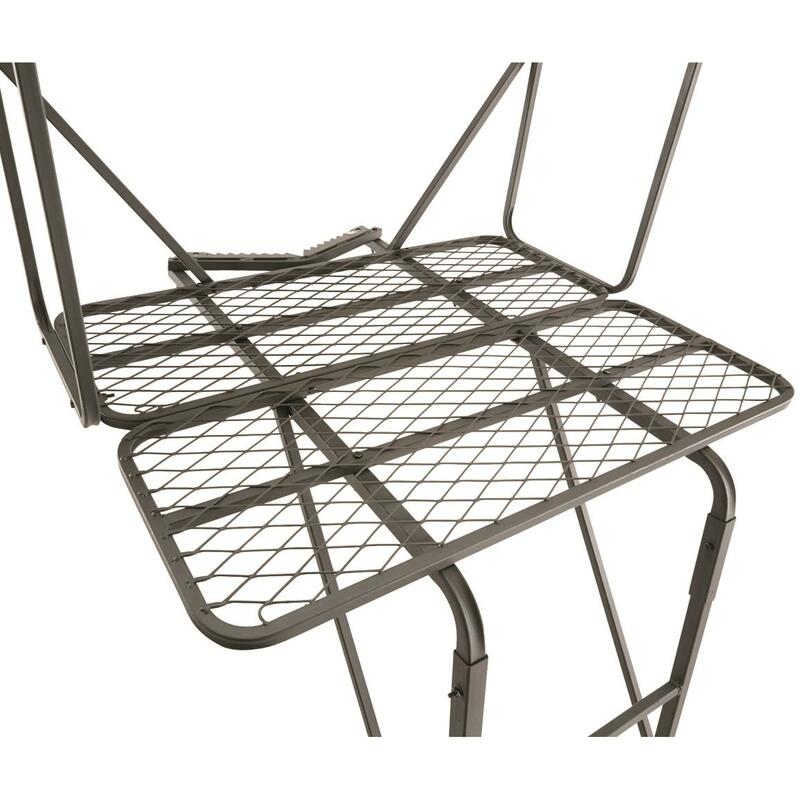 Rated 3 out of 5 by Bill from Basic tree stand - could be improved We ordered and used two of these stands during deer hunting. While they are advertised as a two man stand, that would only apply if the men were of smaller stature and didn't move much while seated.Otherwise, the stands were okay though smaller than expected. There were a number of areas that could be improved: deepen the seat by two to three inches, add another inch of foam to the seat and to the back, add another three and four inches in depth to the platform, enlarge the brace bar and tree bar between the ladder and tree (those items kept the ladder stationary but we used duct tape to keep the connections quiet and had to put a large rubber pad between the brace and tree to stabilize the ladder), and include more substantial stand tie downs and tie off lanyard hook.If you want a basic tree stand, this one will work. If you want a stand that has a bit more room and is more substantial look at the higher priced stands. Rated 4 out of 5 by gagnon994 from Reviews altered my expectations!+ I read all the reviews about this product so I got what I expected. The paint was peeling, the welds are done poorly, the directions were awful, we had to figure out how to put it together and took it apart and redid it a few times. My kit did have the right amount of bolts and hardware though. I won't be leaving the padding outside. I'll take it with me for now. It will have to be remade if I want to leave it out in the weather. This is my first deer stand so it's sufficient for now. It is sturdy on the tree for me and my hunting gear. Don't expect it to be great because it's not, but it's good.